(NaturalNews) For thousands of years, honey has been used across the globe not only as a sweet treat and natural sweetener in recipes, but as a healing substance used for numerous ailments. Modern science is beginning to recognize the many good uses for honey as well. Some of the ways in which the use of honey as shown benefit include: antibacterial/antifungal properties, athletic performance enhancer, source of antioxidants, vitamins and minerals, soothing of coughs, wound management, and skin care, just to name a few. Let's examine a few of the claims about the potential benefits of honey. For thousands of years, honey has been used to treat all kinds of wounds, including burns, ulcers and skin infections. 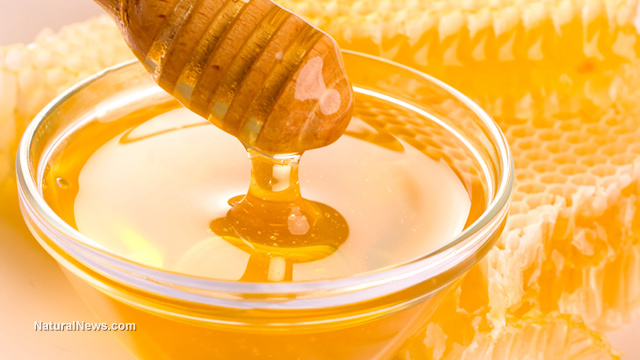 In modern medicine honey is recognized as having antimicrobial properties. It also helps the body's immune response in fighting infection. In a study published in the British Journal of Surgery, "Clinical observations on the wound healing properties of honey," great success was discovered with the use of honey in wound treatment. As noted in the study: "fifty-nine patients with wounds and ulcers most of which (80 percent) had failed to heal with conventional treatment were treated with unprocessed honey. Fifty-eight cases showed remarkable improvement following topical application of honey." Like its many other uses, honey has also been used for eons as a beautification agent, and rightly so. Its ability to improve skin tone and promote a soft, radiant complexion are well documented. The antioxidant and antimicrobial properties of honey make it an ideal way to protect the skin from harmful UV rays, while also supporting skin cells' ability to rejuvenate. It is a prized ingredient in many commercial skin care products because of its hygroscopic nature, which means it is a natural moisturizer. So instead of spending a ton of money on expensive skin care regimens, which in fact may contain honey anyway, why not make your own skin care treatments for a fraction of the cost?